Special Election Day blog post from Schuyler, the leader of our statewide volunteer effort. Our campaign would not have been possible without the dedication and passion of our amazing volunteers, and for that, we can't thank you enough! 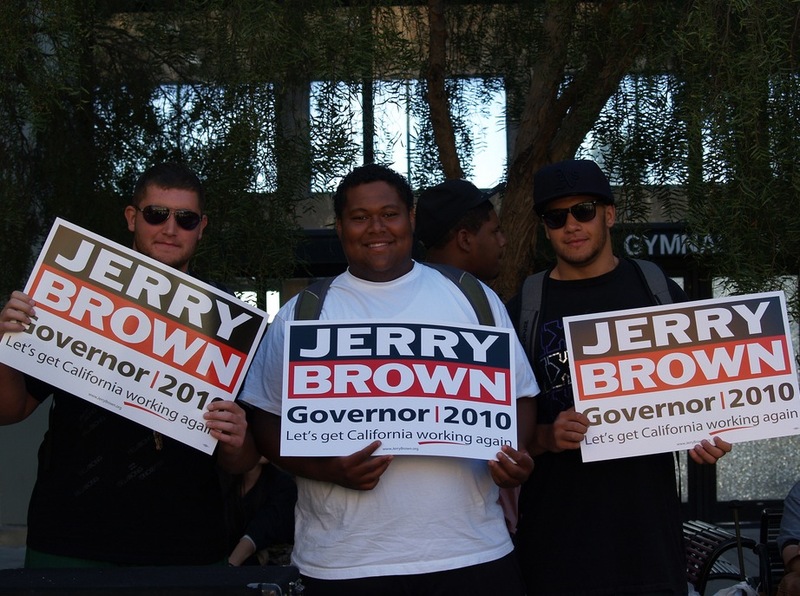 What seems simultaneously like it was yesterday and an eternity ago, we embarked on a campaign to elect Jerry Brown as the next Governor of the State of California. From the beginning, we knew the financial resources of our opponent would be unmatchable. With this understanding, built a campaign based on the passionate dedication of volunteers across the state. I began reaching out to communities throughout California to find leaders willing and able to take on an ambitious task: lead their local countywide field effort to elect Jerry, and do it as a volunteer. It takes a special individual to take on such a challenging job, but it’s those same qualifications that bring out the most altruistic and hard-working people. Our strategy was to not create entirely new systems and networks just for this campaign. We firmly believe each community already has its strong Democratic organizations, and if we could plug into those groups, we would help build up already-existing networks. Our goal was to find the strongest local Democratic contingents and use their resources to support our grassroots campaign. We spoke with Democratic Central Committee leadership throughout the state, talked to local Democratic groups, and interviewed lots of strong candidates, quickly building a statewide operation run entirely by volunteers. Many of the people we selected to spearhead our local countywide campaigns have been community organizers since Jerry began his career, while others have only just begun to engage in local organizing. In some counties, we matched recent college graduates with veteran organizers so that their unique skill sets would complement one another. As our County Coordinators were appointed, they began to build upon their local political infrastructure. We equipped our volunteers with materials, ideas, and resources from the campaign to help them succeed and sent them lists of volunteers in their area who had signed up on our website so they could fold them into local organizing efforts and build deeper support for Democrats throughout their region. Our volunteers have exceeded our expectations at every turn. We have people who quit their jobs to work full-time for the campaign in their county, and others who are casualties of the market downturn and lost their jobs yet spend their time volunteering for Jerry, driven by their faith that he will restore the California Dream. Some volunteers have homes in foreclosure and still use their spare time to fight to get California back on track under Jerry’s leadership. There are so many exceptional volunteers throughout that state, and to mention any by name would be to omit too many others. However, I hope that I can convey the gratitude and respect that I, the campaign staff, and especially Jerry feel for their immeasurable contribution to our effort. Whether they worked one or 100 hours, we couldn’t have done this without them. Although I was born and raised here, my work with leaders and community members throughout the state has given me a deeper love and respect for Californians. The passion our volunteers brought to every task we assigned, the dedication they showed to our campaign, and the infinite belief they have in Jerry to lead our state back from the brink continue to amaze me. So this is our small thank you to our volunteers throughout the state, from whom we draw inspiration on a daily basis. During each conversation I have with a supporter, every phone bank I visit, and at the rallies across California, the enthusiasm our volunteers exhibit encourages me—not only about not this election, but about the future of our state.